During and after Tropical Storm Irene, a number of Massachusetts Conference churches threw open their doors to help their neighbors in need. 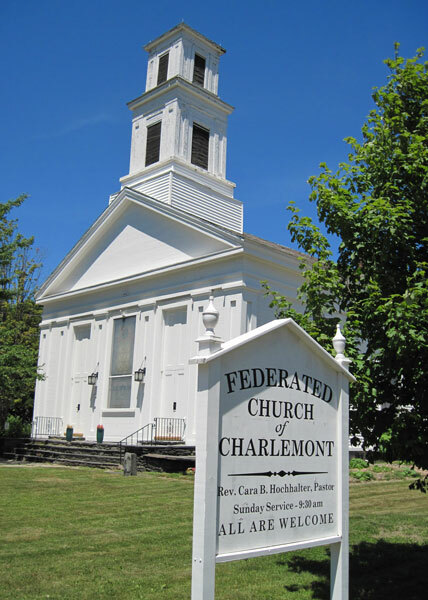 While the storm raged, Charlemont Federated Church hosted 75 neighbors evacuated from low-lying areas. New Bedford's Pilgrim United Church of Christ took in 40 elderly and disabled people for about an hour when their housing complex was evacuated due to wind blowing out a window and ripping siding from the building. After the storm, the First Congregational Church UCC in Williamstown immediately went into action to aid 300 people left homeless when their community of manufactured homes was flooded. The church gave out vouchers and gift cards for food, clothing and gas; and found temporary housing and funding for it for people in need. Also after the storm, the First Congregational Church UCC in North Attleboro opened its doors to the many in the community without power, offering freezer space, hot coffee, snacks and a place to watch television or charge phones, laptops, flashlights and portable DVD players. Those who stepped up to help said it was uplifting work. "It's been an amazing experience," said Gail Burns, the administrative assistant at the Wiliamstown church who jump-started the effort to help those in need in her community. "I've always had great faith in human generosity, but this brought it home in spades." The Williamstown church became the go-to place after the storm for those who had been displaced. "I wanted a door open and a smiling face, and I didn't want anyone to have to wait in line," Burns said. "Someone would come and say 'I need a room,' and I'd call a hotel and then call a member of the community to pay for it. Everyone who came got the help they asked for. Even if it was a tiny bandaid, it helped." Pastor Carrie Bail had been out of town that Monday, but returned Tuesday and headed to the Red Cross shelter housed at the town's Episcopal church. When she found that the shelter wasn't taking pets, she led a group of people with their animals to the Congregational church and worked with Burns to find places where they could stay. She said the town had no point person answering questions, so the church took on that role, helping people find information and pairing them up with those who could help them. People from all over the area brought grocery and pharmacy cards to the church for those in need, sent money and came just to greet people. "By Friday of that week I think we had nearly 100 people through our door; and we still don't know exactly how much help we've given out, but I'm guessing it is probably approaching $10,000," Bail said. And, she said, the work continues. "Now that the initial funds are drying up, we are trying to do matchmaking between people who have offered rooms or apartments and needy individuals. This whole thing is going to take longer than we realized." For the North Attleboro church, the need lasted about four days, until people got their power restored. "There was a constant stream of people each of the days, mostly members and friends,' said Pastor Kelly Thibeault, who said the church was kept open 9 AM to 9 PM for the first three days after the storm. "One night we watched the September 11th episode of West Wing and had an impromptu discussion in preparation for the upcoming anniversary." She said her favorite story of the week was helping a young woman who had come in looking to use a bathroom with a plug . After a search of the church bathrooms proved fruitless, the woman explained she needed to use her hair straightener. Thibeault invited her to use the mirror and plug in her office. "I thought it was kind of a strange request, but the next day I found out that she had a job interview and that by having our doors open we helped her to prepare for it," Thibeault said. At the Charlemont Federated Church, the need was for one day and one night, but it was intense. Pastor Cara Hochhalter said that the church's music minister and two other brave souls had joined her for worship the morning of the storm. After some earnest prayer, they were ready to head home when an EMT burst in to the church, calling out "Hello! Hello! Anyone here?" Hochhalter greeted him and he said they needed to evacuate people to the church from low lying areas. Hochhalter put on coffee and within moments, people began streaming into the church. "Children carrying their cats in carriers, a few dogs on leashes, and people of all ages - a few with walkers, others with canes, teenagers with laptops, and men and women all looking worried," Hochhalter said. "While some of our church members and neighbors began opening cans of beef stew, others made coffee. I greeted each person and tried to make them comfortable." Hochhalter said 75 people came into the church and waited out the storm. "Someone brought in a chicken and our enthusiastic kitchen crew made a huge chicken pasta dish," she added. By evening, the rain had stopped, the river receded, and people headed home. But the pastor was only a block away when she was informed that more people were being sent to the church due to a gas leak. This time, 50 adults and 12 children ended up at the church. They began to watch a movie, but the power went out, so they sat and talked. At about 9:30, they were told they could go home but a dozen people stayed on at the church, sleeping in the pews and on the floor with Hochhalter on the pulpit. The next morning two of them made breakfast. "I was proud that our church could become a shelter from the storm when needed. I was proud of the kind of patience and compassion shown among the people in this commuity! Hochhalter said.